Chelmsford, Mass. – Broadcast Pix™ will introduce the newest model in the BPswitch integrated production switcher product family, BPswitch™ IX, at the 2019 NAB Show (Booth SL4210), which runs April 8-11 in Las Vegas, Nev. Designed for productions that rely on IP-based workflows and remote cameras, BPswitch IX features six network inputs that support NDI and RTSP sources. To promote the new system, Broadcast Pix will give away a free BPswitch IX with camera control at the 2019 NAB Show. NAB attendees are encouraged to pre-register online for a demo at the Broadcast Pix booth. 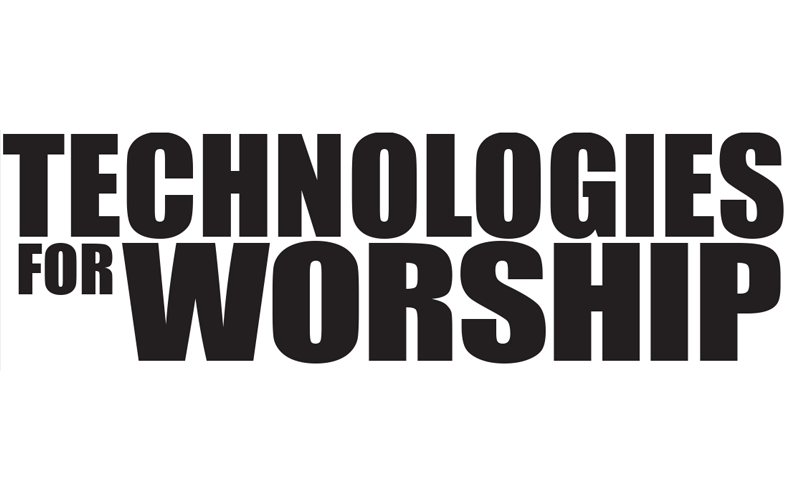 Once their demo is complete, attendees can enter the contest. One winner will be chosen from eligible entries on April 10 at 4:30 p.m. The winner must be present or have a proxy at the Broadcast Pix booth to win. BPswitch IX is designed for auditoriums, stadiums, conference rooms, and other facilities equipped with remote cameras that are switched from a central control room. Along with two SDI/HDMI inputs (including one analog input for legacy sources), it can receive up to six IP camera feeds. The native 1080p/60 system seamlessly integrates MPEG-2, H.264, and other streaming formats in the same production, and provides SDI, HDMI, analog, and streaming outputs. 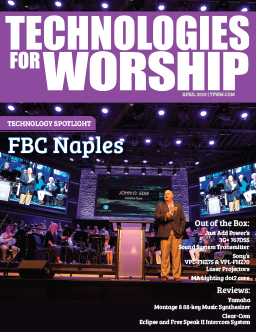 When used with the optional Broadcast Pix Commander™ touchscreen control interface, BPswitch IX allows browser-based control with full-motion video and complete access to all sources and workflow tools using a mobile device and a standard internet connection. 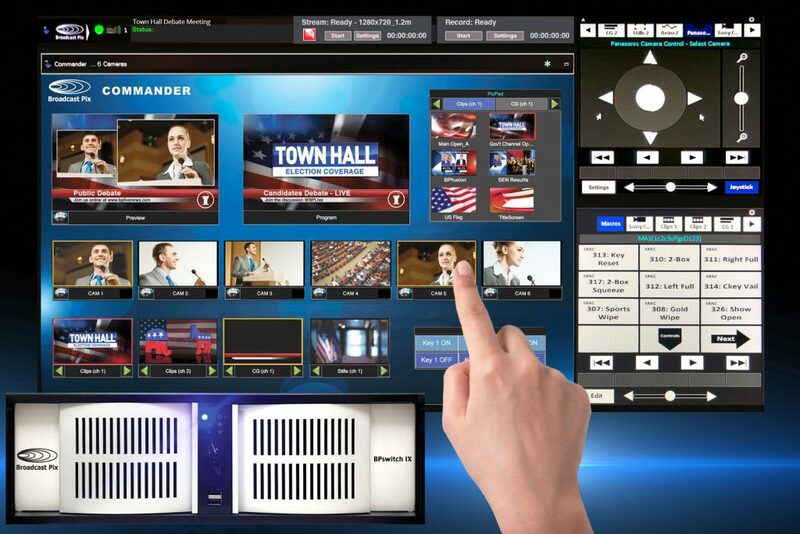 Commander’s simplified controls help non-technical personnel easily switch live productions, add titles, insert clips, and control robotic cameras. Broadcast Pix’s BPNet™ IP ecosystem delivers the system’s control-over-IP capabilities securely and with low latency. Like other BPswitch models, BPswitch IX offers eight channels of clips and graphics, as well as three keyers with DVEs. Plus, the integrated NewBlueNTX multi-layer 3D motion graphics CG includes hundreds of templates to simplify lower-thirds, bugs, animations, rolls, crawls, and effects. 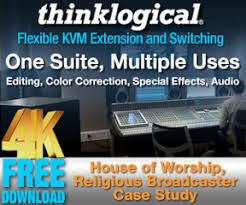 Other built-in workflow tools include program recording, clip and graphic stores, file-based macros, ClearKey™ chromakey and Virtual Studios virtual sets, and customizable BPview™ multi-view. Priced at $9,995, BPswitch is expected to ship in Q3 2019, and will be upgradeable to 4K in the future. For complete details on the BPswitch IX NAB 2019 giveaway, please visit https://goo.gl/2xdCfK.